Get a grip on winter. Put your winter tires on today. No more waiting for your seasonal tire install! Who has time to wait in line for a seasonal tire change. Make your life easy and schedule your seasonal tire change by making a seasonal tire change appointment. Snow tire change cost varies with the type of vehicle. The cost to mount snow tires also depends if you need a snow tire changeover or snow tire swap (see below). Please contact us for snow tire change price. Tire Changeover or Tire Swap? Two sets of tires are changed over on one set of rims. 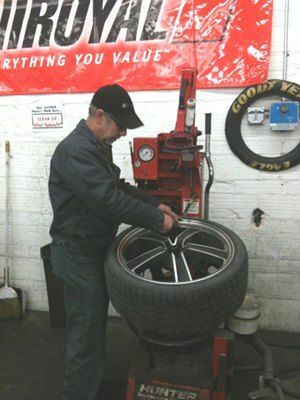 Our tire technicians will remove your tires from your wheels and replace with your other set of tires, then we’ll balance and install the wheels back on your vehicle. *Extra charge for reset of TPS system. This service is for light trucks and SUVs with 1 set of wheels and 2 sets of tires. Two sets of tires, both sets mounted on rims, are swapped onto vehicle. Our tire technicians will remove your wheels from vehicle, balance your other set of wheels, and install them on your vehicle. This service is for light trucks and SUVs with 2 set of wheels and tires. Being able to place your seasonal tire change into your calendar makes life easy. That’s why we’re reminding customers that we make tire change appointments! Bookings are going fast so don't wait! 'Seasonal tire change is something our customers were asking for. We listened and it’s been well-received,” says Bill Winans, owner of Warren Secord Automotive in Kent, WA. "People have busy lives and being able to schedule tire change appointments makes it all so much more convenient". If you need to change your winter tires, summer tires, 3-season, or all-weather tires, now you can make an appointment. A seasonal tire change appointment helps ensure you can get in and out quickly, and avoid waiting. We are still happy to continue taking walk-in tire change if time is available. You can phone, use our online appointment form, or visit our location. We’ll find a time that’s convenient for you. If you want to put your feet up and wait in our clean and comfortable customer lounge during your appointment. Warren Secord Automotive looks forward to seeing you for your winter tire change, whether you schedule your appointment in advance or drop in. Call ahead or stop in to our Kent, WA location for your winter tire change.